Woohoo…Automated Toll system coming soon! I am sure most car owners have faced this one time or the other – waiting in queue of very slow moving cars at a toll booth. I drive quite frequently from Pune to Mumbai and back – and one of the things that I seriously hate is seeing long queue of cars lined up at the Toll collecting stations. What is even more frustrating is the inefficiency of people collecting Tolls – they seem to be never in a hurry. Long queue’s don’t bother them at all. Here is the good news – These long Toll station queues will soon become history (atleast thats what it looks like). Road & Transport ministry have announced that India will soon implement a uniform electronic toll collection system on its national highways, increasing the revenue, curbing leakages and ensuring smooth travel across the country. The new proposed Toll collection system will use RFID ( radio frequency identification ) technology. Once implemented, a person can now travel from Kashmir to Kanyakumari without stopping even once for Toll..wow ! Another reason that I am very optimistic about this becoming a reality is because Indian government had constituted a committee headed by former Infosys chief executive and Unique Identification Authority Chairman Nandan Nilekani for this purpose. How the new electronic toll collection system will work. Every car will be given a RFID tag (costing about Rs.100) which will be stuck on the windscreen of the car, while the Toll booth will have a RFID card reader. When any vehicle with RFID tag passes through this booth across the country, the appropriate toll will be debited from the account. The RFID tag will work similar to mobile prepaid card – where the vehicle owner will have to recharge the card. This new technology will help in so many ways – There will not be any exchange of cash at Toll booth counter, so no leakages in Toll collection. Additionally, it can serve as a platform for vehicle identification and prove effective in tracking stolen vehicles. This is a fantastic development – I just hope that it is implemented on time, the deadline for which is set for May 2012. Aspiring to Work in India? – You Need to have minimum salary of 11 Lakh to get Indian work visa! Why Should Men Have All the Fun? – Even when Women Work Equally Hard! This is how your UID number will look like.. Unique Identification (UID) to Foreigners as well ! An online home for all: a luxury or basic infrastructure? Why are tech giants falling all over themselves wooing the UID babe? its really fantastic, I am waiting for such awesome technology. i have a suggestion for a problem stated by Mr.Sharad. we can have separate lanes for users have the RFID installed and those who don’t have one installed…this can eliminate queues and it will be time saving,…. and i also have a doubt. is this a project of an EEE or ECE student??? its quite good i appriciate your idea and i hope this technology will come as early as possible so that we can used it every where in india . I want to know how did you interface h/w with the s/w. plz help me and send me pdf of that interface. Hi i want to source code how to recharge rfid through online,can any one plz help me..
We offer contact smart cards, contactless cards, UHF products, wristbands, key tags, laundry tags, coin disc tags, animal tags are all our extensive products list. All these items can be modified to suit your makret needs. Welcome to http://www.oprfid.com to know about our infromation. Inquire today and we will respond within 24 hours. Everything i agree and also the project sounds good.. but in this case what about the car who dont have this RFID prepaid Card.. HE will surely wait for cash collection person so help him.. what if some one dont have sufficient balance in the card so that person also will ask for assistance at the window .. still need some more concrete solution for this..
another stupid and ambitious idea by our stupid government! we dont need these ideas if we are going to have national bandhs that stall day to day work. And specifically for this idea: what if the car has not installed the 100 Rs tag. how will the system stop the vehicle and still ensure that there is no hit in traffic. this is just one of the many ideas that politicians and men of power put in our minds…they sow the seeds of thought in our heads that make us believe we are a progressive nation. why do u always use these two cities? just like this idea too! thats all our nation is about! I don’t know what it has to do with UID and infosys former chief. Like the RFID scheme again the UID is going to be a big failure with heavy loss in citizen’s money. Govt is going to feed greedy IT companies for thats going to fail big time. 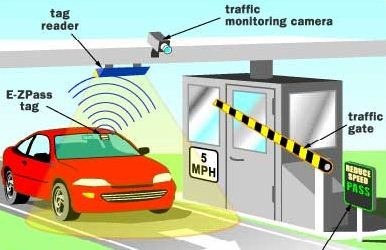 Tollgates in united states already have this, but the vehicle can’t go more than 20mile(32Kmph) through some scanners, but others allow to move at a speed of 80Kmph. Anyway it will be a great move if the buying and crediting amount to card is through online with no office work. Office work still in India is a nightmare. Its really looking a great project but m not that much optimistic about the plan because these things take very long time also after announcing these big projects ministry become oblivious about these issues. like the ‘number portability issue’ postponed 4 times. As u pointed out to use ds facility every car must have a RFID tag which is very difficult to implement in reality… m saying ds looking at d past ‘ govt made a rule dat evry vehicle will have a chit on polution to control d pollution’. its not necessary dat evry person will be having a bank account… wat about the truck drivers and all. inspite of dat my fingers crossed!!! also there are people without balance in there tags that again slow things down by paying cash in tag lanes. From the looks of this project , it looks exciting. But does it totally automate the process ? We still need people to collect toll for those vehicles that don’t have RFID or don’t have a balance . It may result in the same long queues that we see currently.